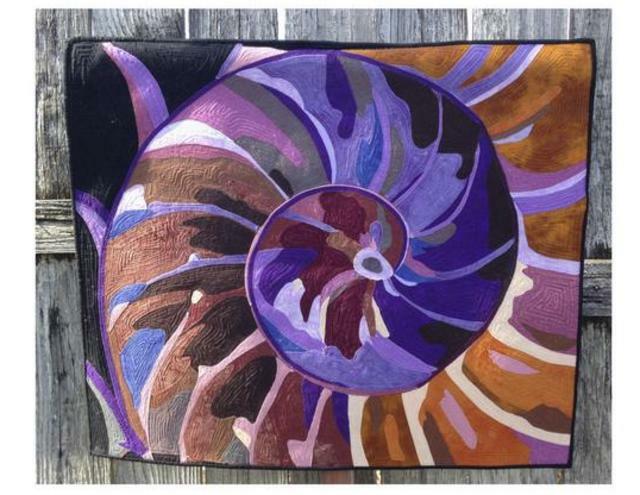 Always thinking of different ways to do things and wanting to try new techniques, I have explored many alternative quilting methods. 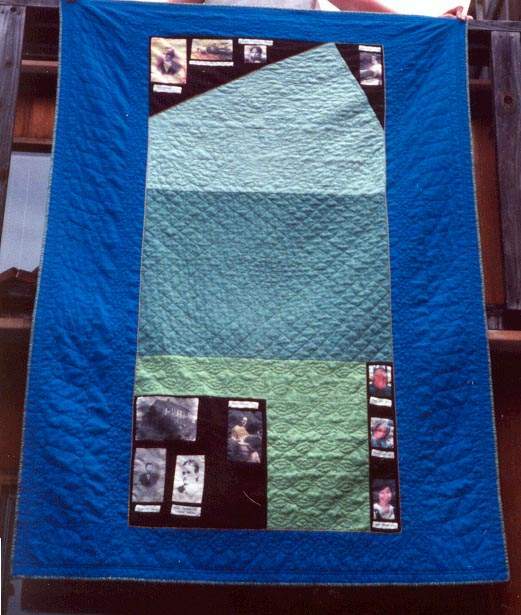 After being involved in my genealogy and also the owner of farm land that has been in the family for five generations, I wanted to make a quilt giving a visual display of both my ancestors who owned the land, and an aerial view of the acreage. The green fabrics represent three separate fields. The top angled edges are the railroad tracks and Anita Rd. The right edge of green is Anita Rd. and the lower edge of green is Hamilton-Nord-Cana Highway (north of Chico, CA). 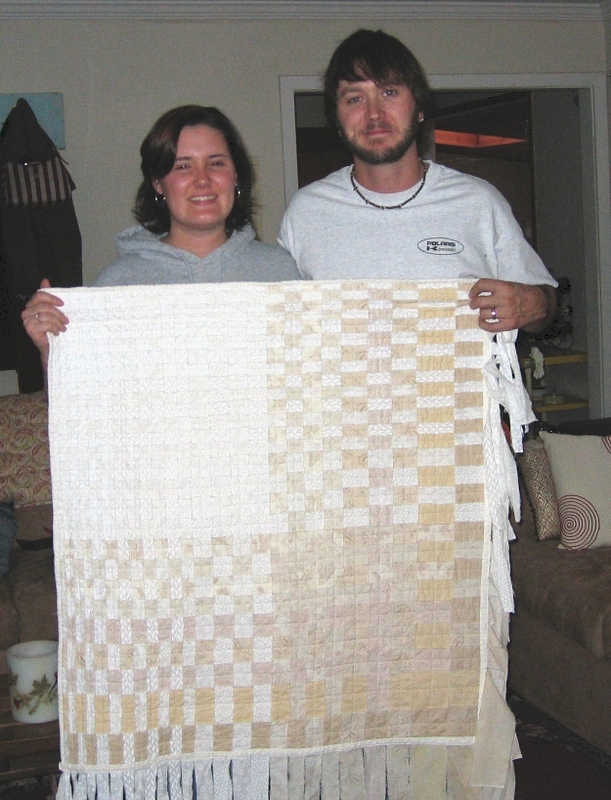 In 2005 I gave the quilt to Derek and Cari as a wedding present. Velda Newman gave a workshop after speaking to Annie Star Quilt Guild. It was fun because we got to paint the apples and lemons before cutting them out and then using them as applique pieces. She also taught how to use various colors of fabric and painting on the fabric to achieve value and texture in the leaves. FUN! I gave this wall hanging to my husband, Tom, for his birthday. 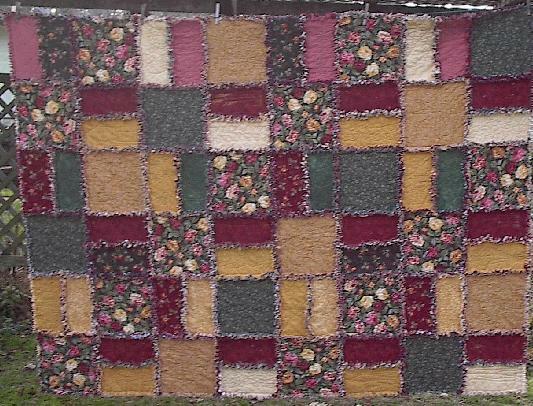 This full size all flannel quilt is a real warm one on our bed. Each square is individually 'sandwiched' with top/batting/back and then machine quilted. Afterward the squares are stitched together with a one inch seam (backs together so unfinished seam is on the front). The seams are then clipped to make a fringe. This was a good way to use up bits and pieces of left over batting. It also provided for some easy practice with machine quilting. 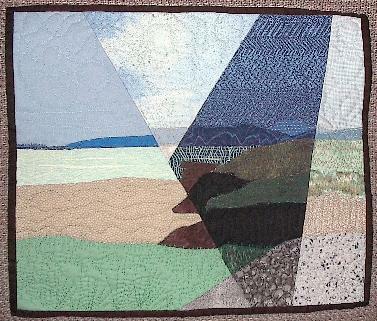 In Karen Pasquini's Fractured Landscape class I was able to represent a photo I had taken (of Ten Mile Beach on the California coast near Fort Bragg) in pieces of fabric. 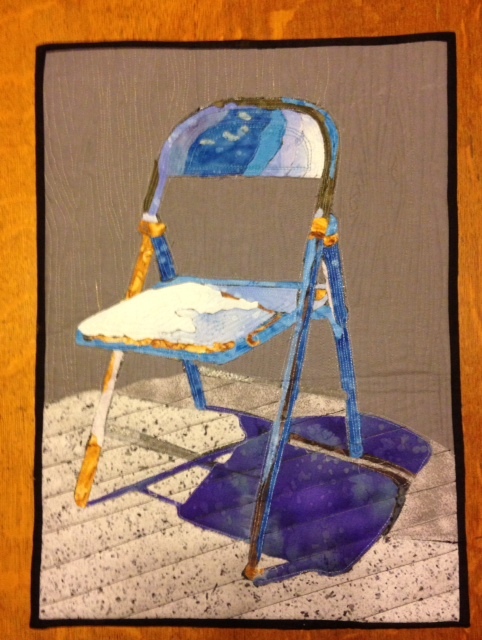 Not only were the steps in planning, arranging, cutting and assembling the fabric a challenge and fun, but the machine quilting she taught freed me up to be braver with other machine quilting projects. 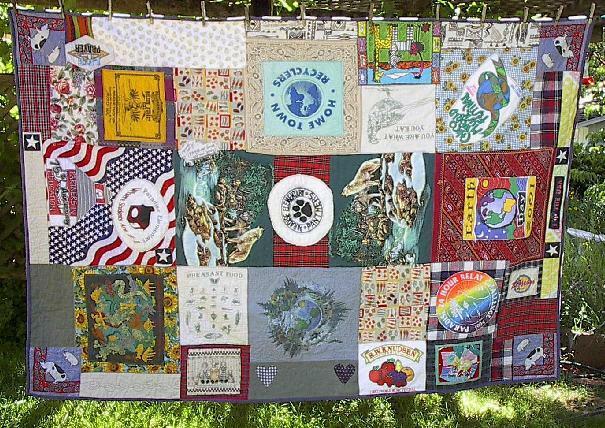 When news came at school that a fellow teacher and long time friend, Steve Watson, was having health problems my immediate response was to make him a healing quilt. 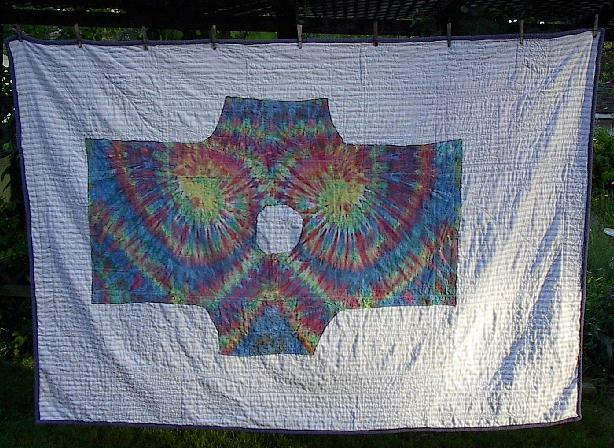 Because of his dedication to recycling I decided to challenge myself and make a quilt that used all recycled materials. A request to staff throughout the school district for fabric of any kind yielded enough material for a good sized quilt using t-shirts, boxer shorts, dresses, pajamas, bandanas and flannel sheets..
Steve is now well and doing fine and still enjoying his quilt. 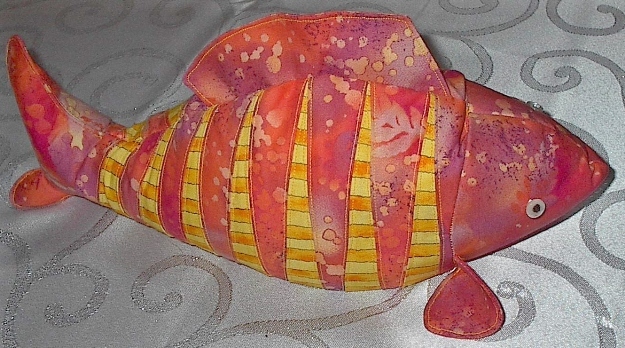 The stuffed fish was given to my daughter, Lani, and her husband, Briny, as they are both Pisces. The holiday stocking was made from a sketch Lani made of what she wanted. I've since made matching ones for Briny, their daughter, Lexi, and son, Dean. It was loads of fun taking a class from Karen Stone! She demonstrated some great applique techniques and encouraged use of many embellishments. My star quilt here was my finished product from the class. Thanks, Karen! My friend, Bonnie, gave me for my birthday (May 2006) the pattern for this fantastic poppy. She also had the pattern and thought we would BOTH enjoy making the poppy. 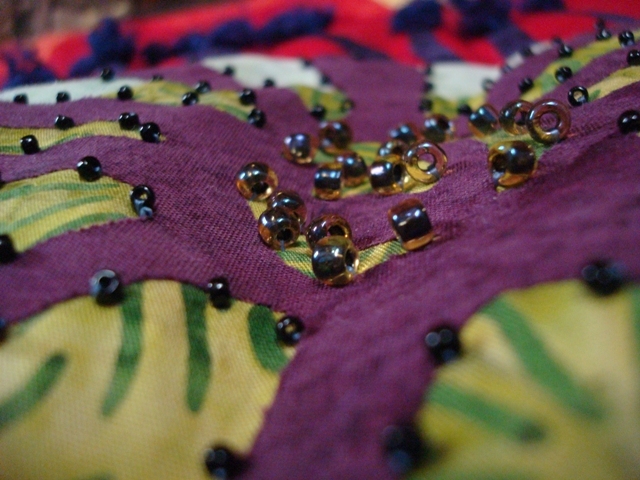 By May of 2007 I had hand appliqued the petals and center and machine quilted the piece. In the top photo at right it lacks the ends of the stamen and the detail bead work at the center. It was challenging and fun. 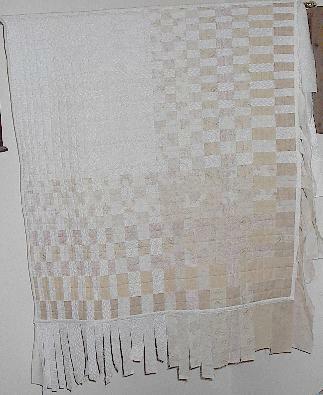 It is a wall hanging measuring about 3x4 feet. After working with fall leaves and making shadows of them (see 'Journal Quilt') and being inspired by a pattern from a quilt store in Ashland, OR, I decided to do a wall hanging. First I collected a variety of leaves and scanned them. Then I enlarged the scan and printed onto transfer paper. After ironing onto white fabric I cut out the shape along with an iron on stabilizer and pressed the cloth leaf onto a background. 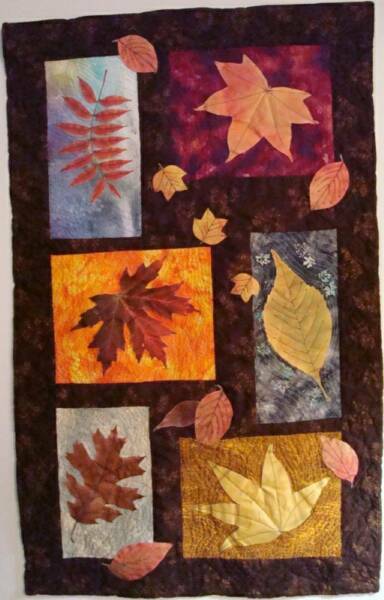 The next step was sashing the leaf squares together, adding additional stray leaves and then quilting the leaves, the backgrounds, the sashing and the border. I started the project in October 2007 and completed it in January 2008. It measures 42 1/2" X 27". For Melinda Bula's class at Empty Spools Seminars at Asilomar, Feb./Mar. 2014, we were asked to bring a picture of a flower. I was more attracted by a photo I'd seen of a nautilus sea shell so that was my project for the class. After a week of tracing, piecing, placing, pressing and re-doing, I left with the basic image completed. Once home and after receiving the ordered 30 weight rayon thread, I began quilting my piece. 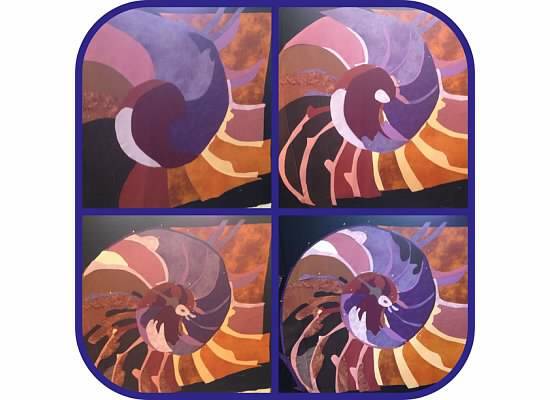 Below you will see a progression of the building of the quilt and then the final product…NAUTILUS! 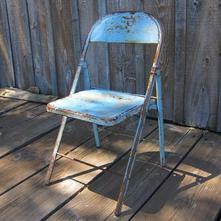 When searching for subject matter for a class taught by a fellow guild member, I was attracted by this photo of a blue chair, taken by a cabin neighbor, Catherine Goggia. 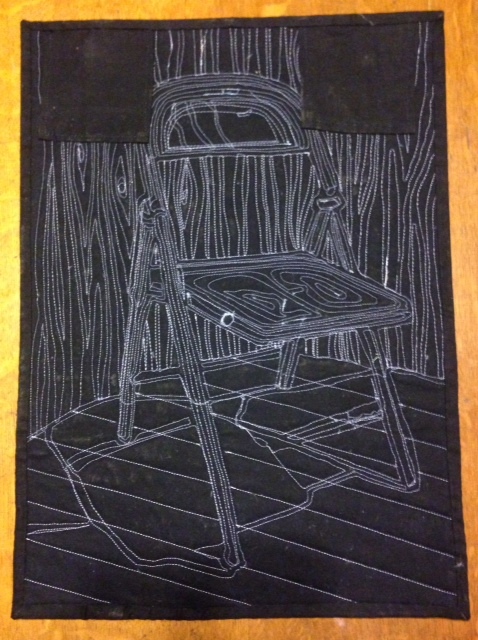 A large outline pattern was made on freezer paper and fabric was fused to a black background. 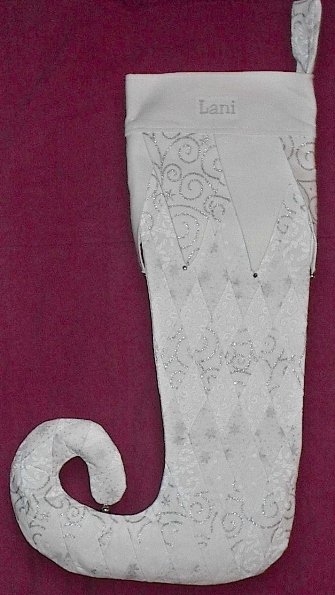 Below are images of the completed work…front and back.